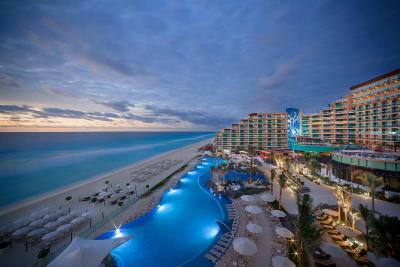 Lock in a great price for Hard Rock Hotel Cancun All Inclusive – rated 8.7 by recent guests! The rooms were confortable, cleaned and beautiful. The food and cocktails were delicious and the staff were amazing! Probably the best hotel i've been to so far. It was an unmatchable experience by far. 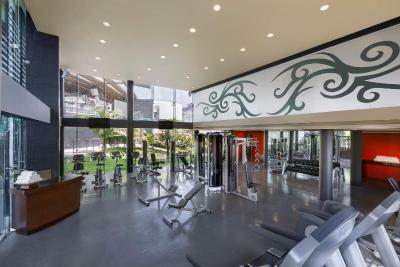 The food, the facilities, the staff, everything was on spot. 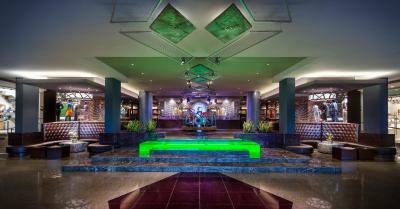 The hotel has a different style and the rock theme is very nice for the music lovers. The waiters are very nice. Hard Rock Hotel Cancun All Inclusive This rating is a reflection of how the property compares to the industry standard when it comes to price, facilities and services available. It's based on a self-evaluation by the property. Use this rating to help choose your stay! 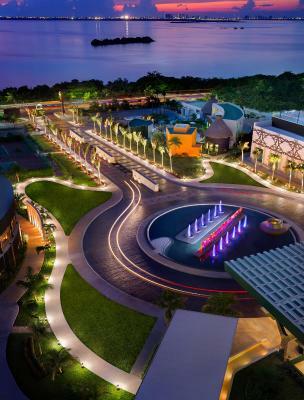 One of our top picks in Cancún.Endless entertainment, activities and relaxation await guests at this exceptional oceanfront all-inclusive resort, in Cancun's Hotel Zone and offering first-class accommodations, complete with a double hot tub and private balconies. 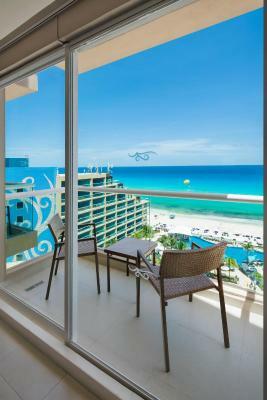 The suites at Hard Rock Hotel Cancun All Inclusive feature free Wi-Fi and free music streaming channels along with a fully stocked minibar with sodas, bottled water, juice & domestic beer and an in-room liquor dispenser. 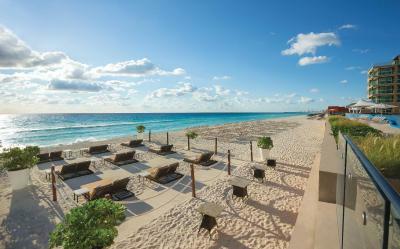 Hard Rock Hotel Cancun All Inclusive provides guests with a large variety of luxurious amenities and facilities. 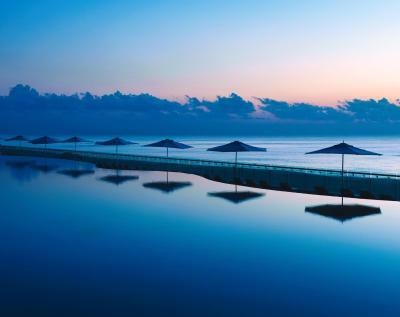 Guests can enjoy a spacious outdoor pool overlooking the ocean, 2 on-site tennis courts and a full-service spa. 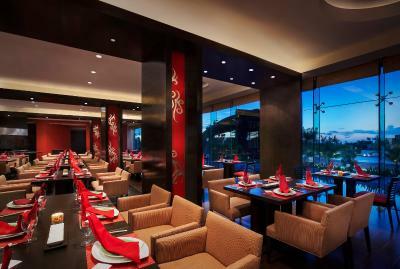 There are also 5 gourmet restaurants on-site, featuring a variety of international cuisine. 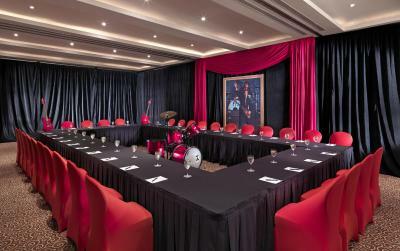 With a kids and teen club, live nightly entertainment and organized tours of the area, guests of all ages can have an unforgettable stay at Hard Rock Hotel Cancun All Inclusive. On-site car rental service also makes nearby attractions, such as Chichen Itza, and Ek-Balam, easily accessible. 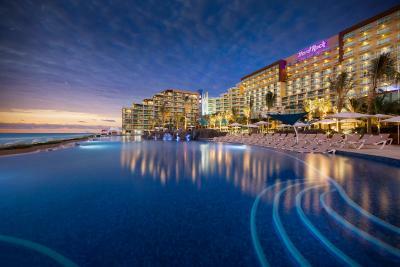 When would you like to stay at Hard Rock Hotel Cancun All Inclusive? 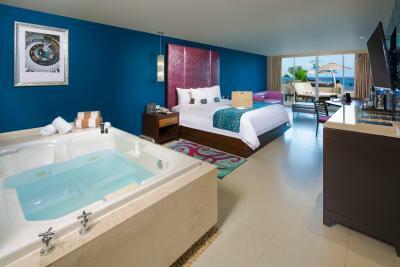 The room features a dual hot tub, flat-screen satellite TV and iPod docking station. The private bathroom has signature toiletries and a hairdryer. It also has bathrobes and slippers available. The balcony with ocean views is furnished. The room has 2 double-sized beds. 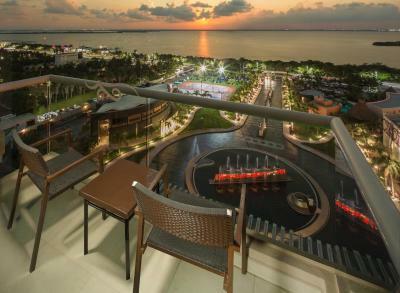 This double room has a furnished balcony featuring lagoon views. The room also includes a double hydro-massage tub, private bath with showers, minibar with soda, bottled water, juice & domestic beer and liquor dispenser. 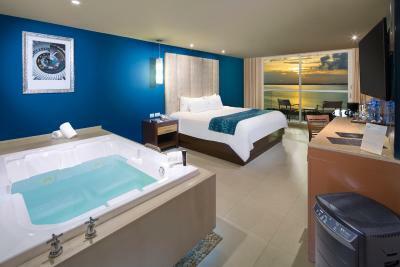 The Diamond Deluxe Room features a dual hot tub, LCD flat-screen satellite TV and iPod docking station. 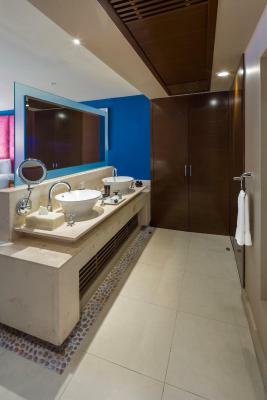 The private bathroom offers signature toiletries and a hairdryer. It also has bathrobes and slippers. 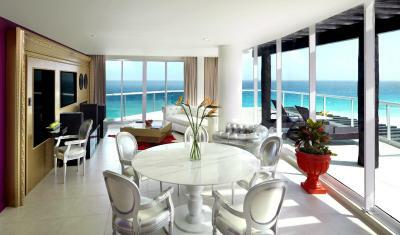 The balcony with ocean views is furnished. The king size bed is dressed with premium cotton linens. Please note, children are not allowed in this room type. 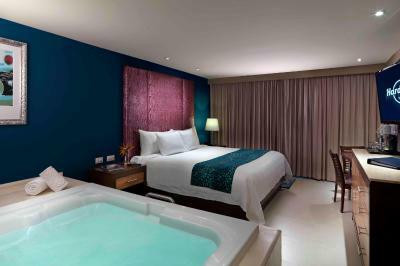 The Deluxe Room features a dual hot tub, LCD flat-screen satellite TV and iPod docking station. 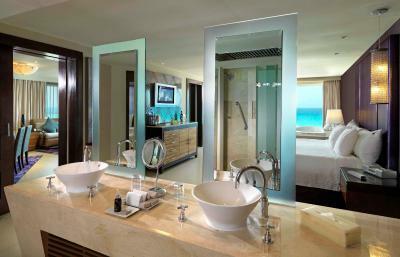 The private bathroom offers signature toiletries and a hairdryer. It also has bathrobes and slippers available. 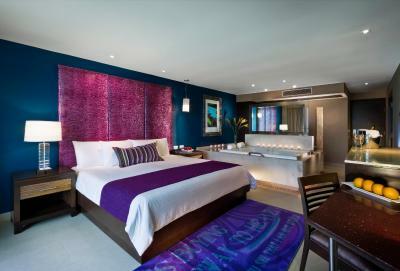 The room may either have a king bed, or 2 double beds, dressed with premium cotton linens. 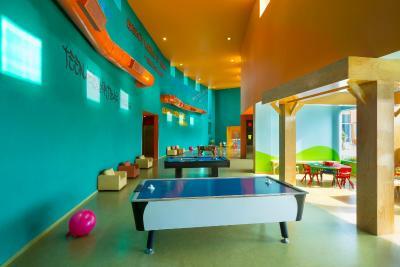 The family room has 2 connecting rooms featuring lagoon views. 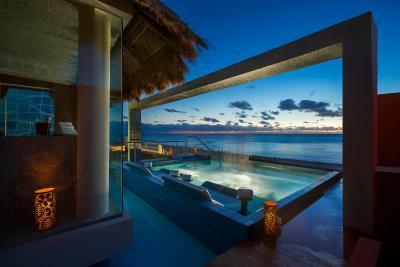 Features a dual hot tub and a flat-screen satellite TV. 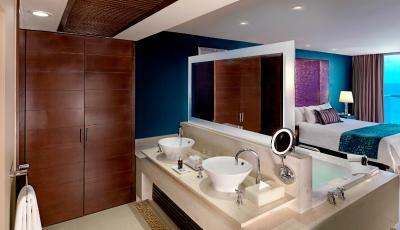 This room also includes a private bathroom with signature toiletries and a hairdryer. It also has bathrobes and slippers available. Please note that this room is only available for people traveling with children. 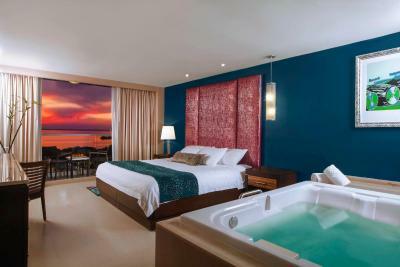 The Platinum Deluxe Room features a two-persons hot tub, LCD flat-screen satellite TV and iPod docking station. The private bathroom has signature toiletries and a hairdryer. It also has bathrobes and slippers available. The balcony with ocean views is furnished. 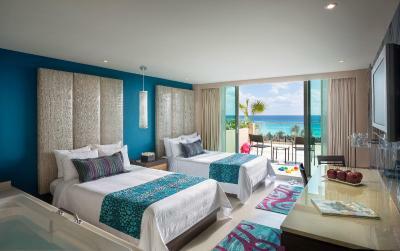 This King room has a furnished balcony featuring lagoon views. The room also offers a double hydro-massage tub, private bath with showers, mini-bar with soda, bottled water, juice & domestic beer and liquor dispenser. 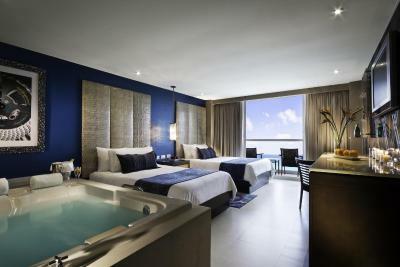 This suite features a king-sized bed, bathtub, hair dryer, slippers, bathrobe, ironing facilities and Rock Spa bath products. A LCD TV is also available. -Premium Liquor dispenser - Absolut, Bacardi White, Johnny Walker Black Label, Jose Cuervo Especial. 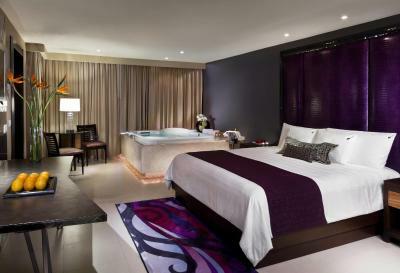 This suite features 2 bedrooms, one bedroom with a king-sized bed and a second bedroom with two double beds. 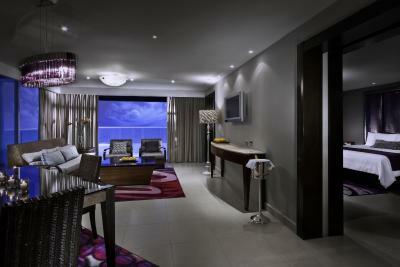 This suite includes a living area and dining area, ironing facilities, LCD TV, coffee maker and mini bar. Private bathroom comes with shower, hair dryer, bathrobes, slippers and toiletries. This double room has a balcony, air conditioning and flat-screen TV. This double room features a balcony, mini-bar and tumble dryer. Serving with style that knows no limits, we have taken all the incredible Rock & Roll experience and made into a vacation that needs to be lived. 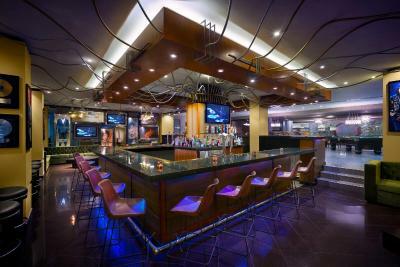 This includes access access to unbelievable All Inclusive amenities like experiential dining, never-ending cocktails and in-room drinks from a personal liquor dispenser, legendary entertainment, and top-shelf everything. It’s All Day. All Night. All Included, baby. 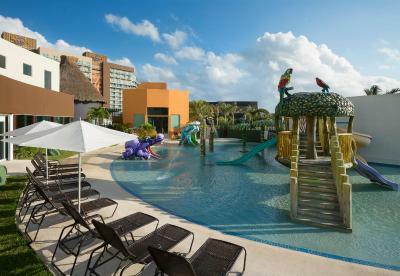 House Rules Hard Rock Hotel Cancun All Inclusive takes special requests – add in the next step! 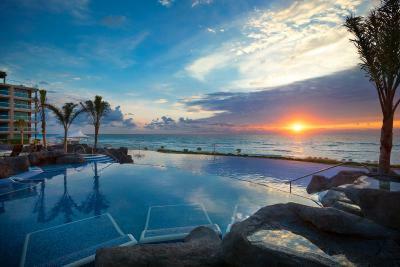 Hard Rock Hotel Cancun All Inclusive accepts these cards and reserves the right to temporarily hold an amount prior to arrival. Please note that the Family Room at this hotel is only available for people traveling with children. Minibar and toiletries will not be restocked if you don’t leave bribes in the fridge or the room . I don’t believe in tipping to get basic toiletries supplies and the mini bar restocked. We tipped good waiters and outstanding service not basic services that in an all inclusive hotel for these prices should be first class. The hotel says the tips are included in the all inclusive rate and you are paying a huge price to stay here I think that these services should be professional standard. Hard to get sun beds without getting up early and leaving towels on the beds to reserve your place which I don’t like doing but with everyone doing the same you kind of have to to get a place. A bit more entertainment for late at night would be good, no one seems to want to go to the late night dj held in one of the reception rooms. Being hard rock hotel they should probably have more live bands which I think people would stay to watch. 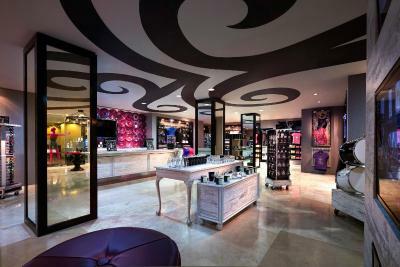 A little bit pricey but totally worth it with just the minor issue of the mini bar and toiletries. They could leave a few snacks in the room at the price you are paying too. Property is first class and beautiful, rooms are great with a hot tub included and a great pool and two excellent pool bars. So many staff walking around making sure you have everything you need ,drinks, food ,everything . Entertainment was great for the most part with always something interesting going on and a great team of young dancers who keep you entertained the whole day. Beach area was exceptional and clean. Drinks are top notch and have many choices. 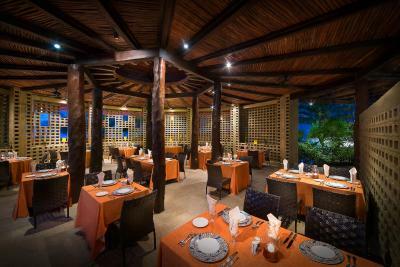 Ipanema restaurant was fantastic and the buffet was always with so many great choices. Everyone is so helpful and friendly. 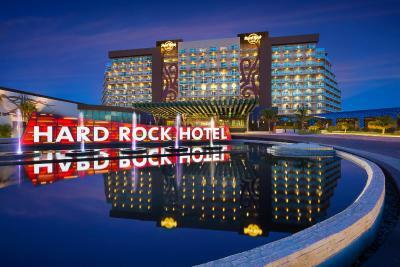 We stayed at another all inclusive before hard rock and the difference is unbelievable, so much better we ended up booking another two nights at hard rock because it was so good. 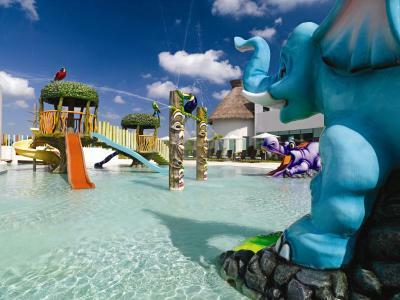 It couldn't have been more Enjoyable vacation, the facility was clean and exceptionally nice the staff was polite and always willing to help. The food was endless And top quality. A very nice hotel, perfect location, great food, pleasant staff. The music was to loud at pool and pools were a little cold. Hard Rock seemed a little dated in comparison to hard rock punts cana. I'd expect stain free sheets when staying at a hotel of that price range. The cleaning wasn't that great either. There were too few sunbeds by the pool, which is usually the problem at large all-inclusive hotels, I guess, but still. They'd put out sunbeds in the water, which was great, but limited what you could bring with you to the pool, though. 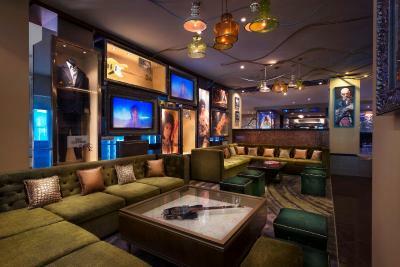 I really like the concept of Hard Rock, although this was my first stay at one of their hotels. Definitely not the last though. The food was awesome - anywhere on the property. Very friendly and helpful staff. 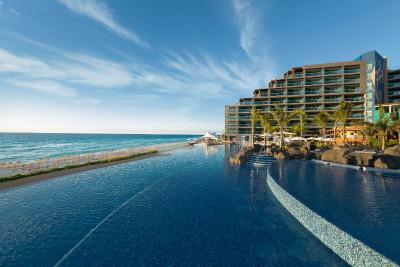 The pool was large, which is great, since the waves make it kind of hard to swim at Cancun's beach. The ocean view from my balcony was awesome. We hated it. It was not as sold and loud screaming people in the lobby after having contacted directly to ask if it would be a correct booking for relaxing hotel stay for one night. When we asked to change and cancel the booking as soon as we arrived we were told no and asked to travel 90 mins to another resort of theirs. Very disappointing having stayed in many hardrocks with great experiences prior. I’m still trying to chase the manager Diego or Katie to issue is a refund as we moved hotel immediately and so have paid for 2 rooms pointlessly. Sometimes it was too cold in the restaruants because of the air conditioning. 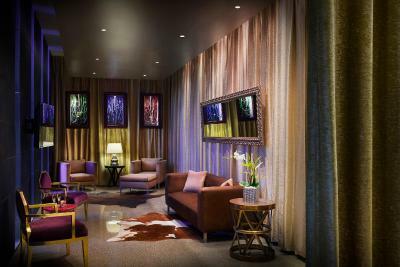 A small disco inside the property (in a seperate room) could be nice for those who like the nightlife. The WIFI at the beach is not working propperly. Everything was really perfect! 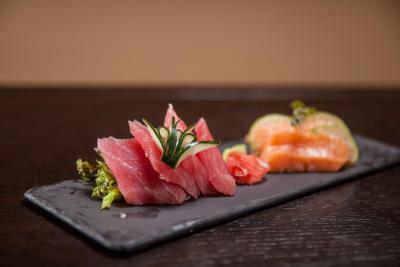 If you like good and varied food (Asian, Brazilian, Mexican, etc.) this hotel would be perfect for you. The location of the hotel is also perfect, is quite, directly at the beach and if you like nightlife you have just to take the taxi for about 10 minutes to the party zone. The property was very clean and the staff super friendly.